Just watched Eden and After by Robbe-Grillet and loved the Mondrian style in the first half. So I decided to line up The Black Cat by Ulmer to watch this evening for similar Bauhaus styled sets. Can anyone recommend films with similar Bauhuas style architecture. I'm thinking there must be something in Fassbinder's catalogue. I think in World on a Wire it's more postmodern, which is apparently the origin of the term postmodern, as a reaction to the utilitarianism of Bauhaus. And as an a-side any times Mondrian appears in films. I can think of a short stopp motion film called The Box Man based on the Abe story. I'm not really knowledgeable about architecture, but with Bauhaus I'm reminded of Jacques Tati's world, in particular Playtime (1967) and Mon Oncle (1958). Gropius Memory Palace is a portrait of the Fagus Factory in Alfeld, Germany, one of the earliest designs of Bauhaus architect Walter Gropius. The Fagus Factory opened in 1913 and remains in operation, continuing to make shoe lasts (wooden or plastic molds used in constructing shoes). It is also a UNESCO World Heritage Site and museum. 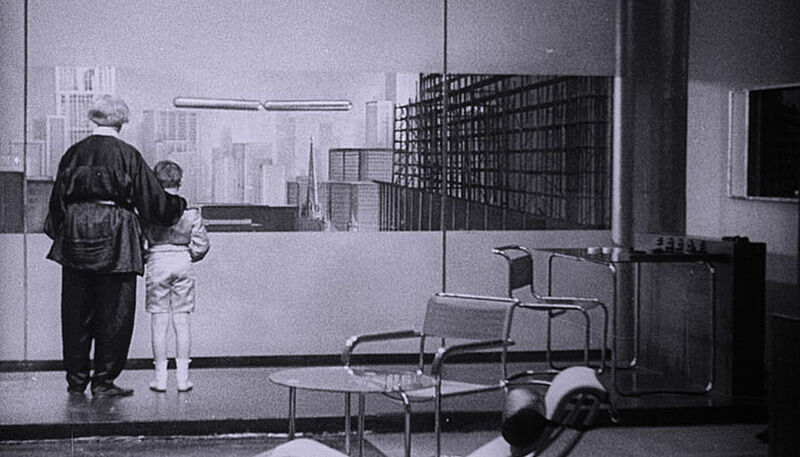 The film invites viewers to participate in a guided meditation exercise in which they construct a “memory palace” from the rooms of Walter Gropius’s iconic factory. This ancient technique engages a specific architectural setting to store new memories, or perhaps reformat old ones. In this case, a viewer uses the Fagus Factory as a setting to explore images related to work. Blurring the lines between a therapeutic tool and architecture film, the project seeks to soothe anxieties around technology’s effects on the body and the workplace, and explores the relationship between memory and architecture. I was thinking of Metroplis when I made the thread but I guess that's more Art Deco, and a lot of early Hollywood. I'd never thought about Tati in that way before but it seems to fit. That looks great @blocho shame it will be difficult to see. A still I found from a 'lost' Austrian film Die Vom 17er Haus 1932.